This post provides an initial look at climate model simulations of the top of the atmosphere (TOA) energy budget and its three components. It includes the outputs of the climate models stored in the CMIP5 archive (used by the IPCC for the 5th Assessment Report). 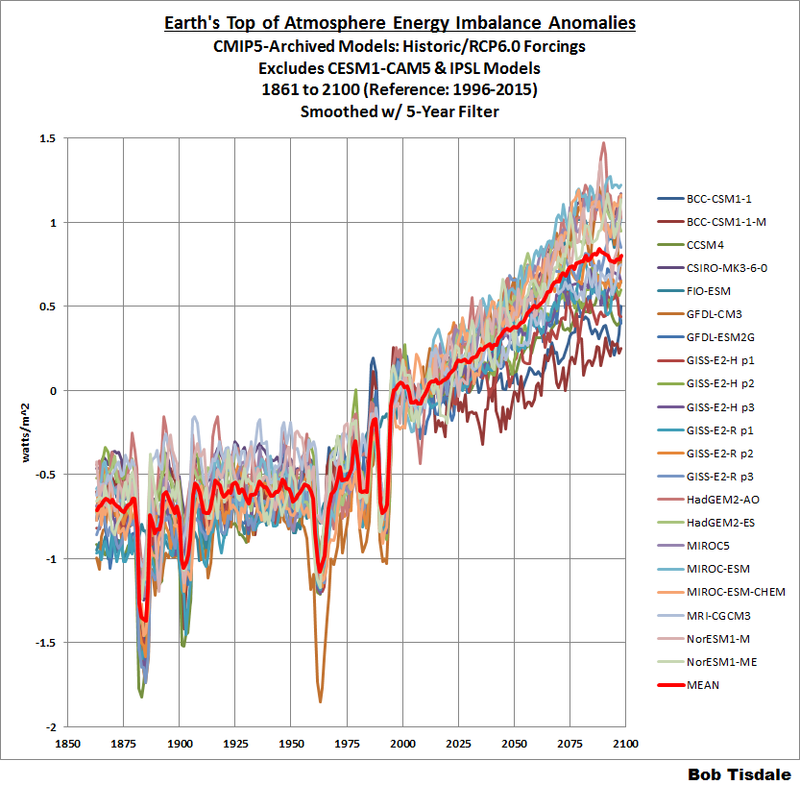 There are astonishing differences in the modeled estimates of the past, present and future imbalances and the three components that make up the top of the atmosphere (TOA) energy budget. That is, there is no agreement on the magnitude of TOA Earth’s energy imbalance in the models, and there are even wider disagreements in the calculated components that make up that energy budget, how they evolved in the past, and how they may evolve in the future…all suggesting, among the models, there is little agreement in the modeled processes and physics that contribute to global warming now, contributed to it in the past and might contribute to it in the future. For those new to this discussion, the Earth is said to have an Energy Budget. Trenberth et al. 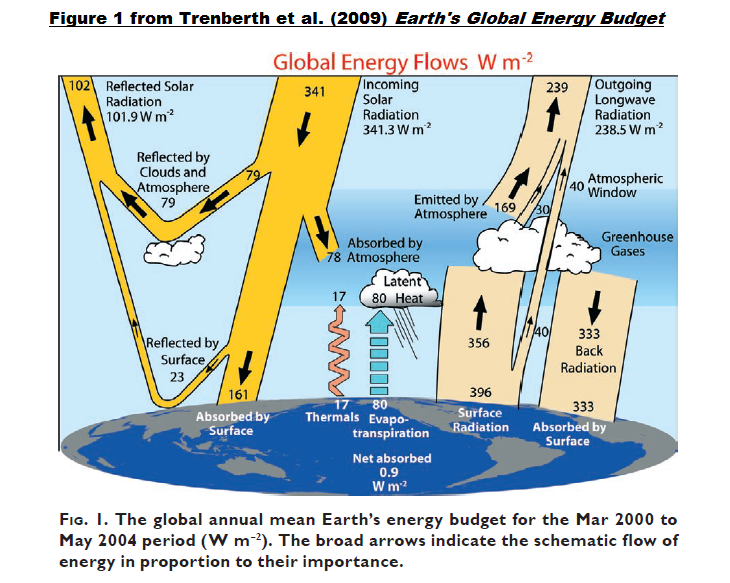 (2009) Earth’s Global Energy Budget provided a reasonably easy-to-understand discussion of the factors that impact that budget at the top of the atmosphere. My Figure 1 is Figure 1 from Trenberth et al. (2009). Focus your attention on the values of the three components at the top of the atmosphere. Those factors balance. That is, the energy from the sun (incoming solar radiation, a.k.a. Incident Shortwave Radiation) is equal to the sum of the sunlight reflected back to space (reflected solar radiation, a.k.a. Outgoing Shortwave Radiation) and the infrared radiation the Earth emits to space (Outgoing Longwave Radiation). The hypothesis of human-induced global warming says that manmade greenhouse gases cause an imbalance in that budget. Note that the value for the incoming solar radiation (341.3 watts/m^2) is much less than the values you are used to seeing for Total Solar Irradiance (TSI) at the top of the atmosphere, which is about 1366 watts/m^2. Why the lower number in the energy budget? The sun only shines on half the Earth at one time and, because the Earth is spherical, sunlight is not distributed evenly across Earth’s surface. So the incident shortwave (solar) radiation is ¼ the TSI value. See the NASA EarthObservatory webpage Incoming Sunlight for a further discussion. We’ll be discussing and illustrating the input values and the climate-model-created values of the components at the top of the atmosphere, and their difference, known as the Energy Imbalance. With increasing greenhouse gases in the atmosphere, there is an imbalance in energy flows in and out of the earth system at the top of the atmosphere (TOA): the greenhouse gases increasingly trap more radiation and hence create warming (Solomon et al. 2007; Trenberth et al. 2009). ‘‘Warming’’ really means heating and extra energy, and hence it can be manifested in many ways. Rising surface temperatures are just one manifestation. Melting Arctic sea ice is another. Increasing the water cycle and altering storms is yet another way that the overall energy imbalance can be perturbed by changing clouds and albedo. However, most of the excess energy goes into the ocean (Bindoff et al. 2007; Trenberth 2009). Can we monitor the energy imbalance with direct measurements, and can we track where the energy goes? Certainly we need to be able to answer these questions if we are to properly track how climate change is manifested and quantify implications for the future. And we certainly need to look at how climate models attempt to answer those questions. All estimates (OHC and TOA) show that over the past decade the energy imbalance ranges between about 0.5 and 1 Wm-2. The estimates of 0.5 to 1 watts/m^2 (watts per square meter, referenced to Earth’s surface area) are only 0.15 % to 0.29 % of the 341 watts/m^2 estimated amount of sunlight at the top of the atmosphere shown in Figure 1. 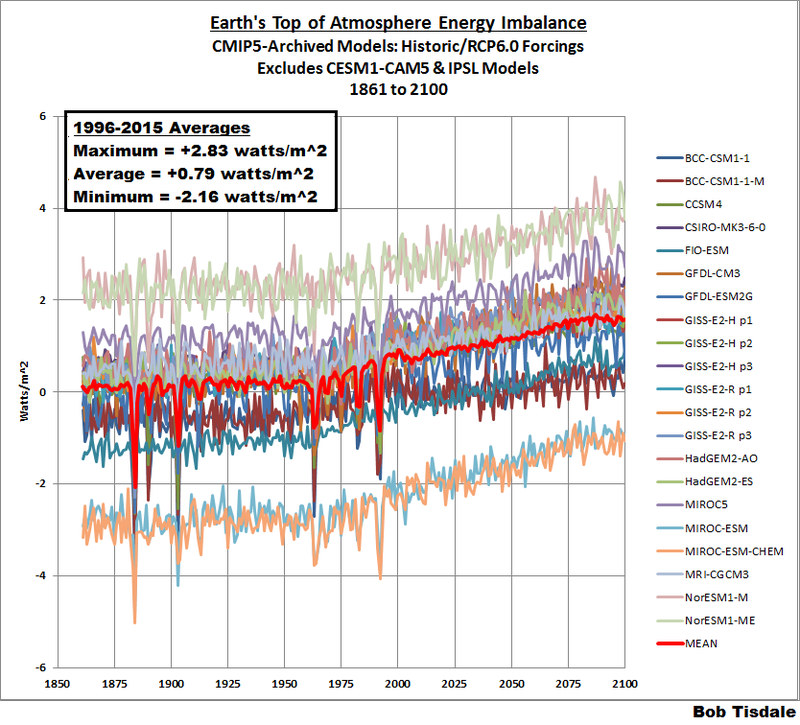 As you will see in this post, the range of the climate-modeled energy imbalance has a much larger range, about 10 times the 0.5 watts/m^2 range mentioned by Trenberth et al. (2014). And there is no agreement about how the imbalance was created in the past, or might be created in the future. The climate models used in this post are from the Coupled Model Intercomparison Project, Phase 5 (CMIP5) archive. The source of the model outputs is the KNMI Climate Explorer, specifically from the Radiation variables on the Monthly CMIP5 scenario runs webpage. The TOA Incident Shortwave Radiation (incoming downward solar radiation) is identified as rsdt on that KNMI webpage, the TOA Outgoing Shortwave Radiation (reflected solar radiation) as rsut, and the TOA Outgoing Longwave Radiation (emitted infrared radiation) as rlut. I’ve used the higher of the middle-of-the-road scenarios, RCP6.0, and downloaded the outputs individually for each model. That leaves 21 models, including BCC-CSM1-1, BCC-CSM1-1-M, CCSM4 (6 runs), CSIRO-MK3-6-0 (10 runs), FIO-ESM (3 runs), GFDL-CM3, GFDL-ESM2G, GISS-E2-H p1, GISS-E2-H p2, GISS-E2-H p3, GISS-E2-R p1, GISS-E2-R p2, GISS-E2-R p3, HadGEM2-AO, HadGEM2-ES (3 runs), MIROC5 (3 runs), MIROC-ESM, MIROC-ESM-CHEM, MRI-CGCM3, NorESM1-M, and NorESM1-ME. For those models with multiple runs, the ensemble members are averaged before being presented in this post and before being included in the multi-model mean. The multi-model mean for the radiative imbalance at the top of the atmosphere is shown in the top graph (Cell a) of Figure 2. The graphs run from 1861 to 2100. The multi-model mean of the individual components (Incident Shortwave Radiation, Outgoing Shortwave Radiation and Outgoing Longwave Radiation) are also shown in the Cells b to d. Listed on each of the graphs is the average value for the period of 1996 to 2015. (Explanation for those years: The historic portions of the simulations run from 1861 to 2005, while the forecasts based on projected RCP6.0 forcings run from 2006 to 2100. So the period of 1996 to 2015 includes the last 10 years of hindcast and first 10 years of forecast. They’ll serve as our base years for anomalies in future graphs.) The values of the averages are close to those shown in Figure 1 from Trenberth et al. (2009). Note the increase in TOA Incident Shortwave Radiation from 1900 to the early 1950s (Cell b). That indicates the modelers are still trying to explain part of the warming in the first half of the 20th Century with a notable increase in the output of the sun, which may or may not have happened. Also notice the decrease in the amplitude of the solar cycle during the 21st Century. Explanation: The modelers use different lengths for the solar cycle in future decades. They grow farther out of synch with time, so the average decreases in amplitude. But the multi-model means are not the focus of this post. Our interests are the wide ranges in the model simulations of Earth’s Energy Imbalance at the top of the atmosphere and its components. Let’s start with the incident shortwave radiation. The incident shortwave radiation at the top of the atmosphere is based on a climate model forcing. The CMIP5 – Modeling Info – Forcing Data webpage provides a link to the SOLARIS website for the recommended solar forcing data. The recommendations can be found here. They recommend a total solar irradiance reconstruction by Judith Lean, and provide very clear instructions for solar cycles in the future…repeat Solar Cycle 23. Apparently there were different interpretations of the recommendations. See Figure 3, which presents the model outputs of TOA incident shortwave radiation in absolute form. There are three primary groupings. The 2 models from one modeling group start about 338.5 watts/m^2. There’s the middle grouping of 5 models that start around 340.25 watts/m^2. Then there is the grouping of the other 14 models starting about 341.5 watts/m^2. You’ll note that I’ve listed the average, maximum and minimum values for the base period of 1996 to 2015. There is almost a 3 watts/m^2 spread in the TOA incident shortwave radiation among the models during our base period. 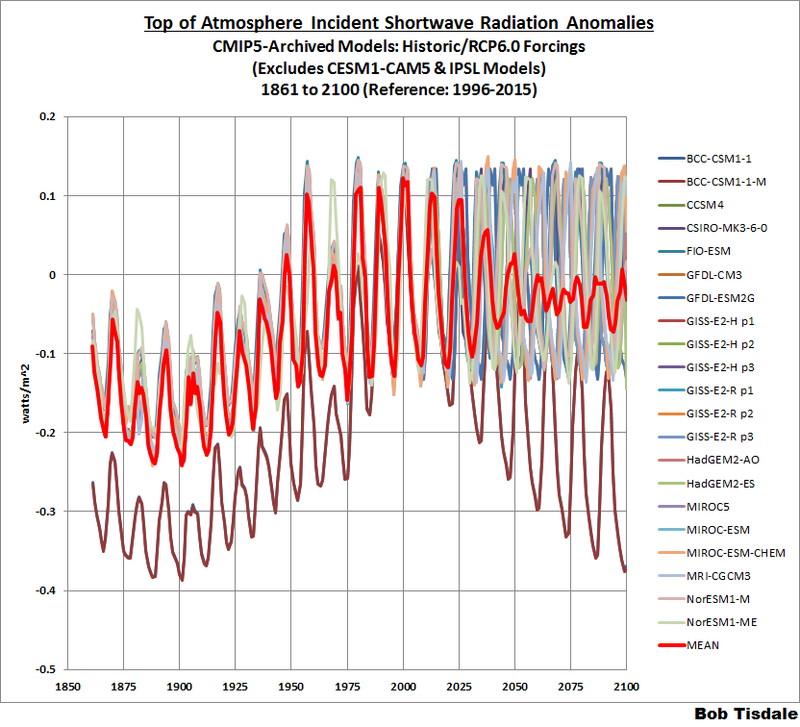 In Figure 4, the climate model outputs of TOA incident shortwave radiation are presented as anomalies, with the base years of 1996-2015. With the model outputs in anomaly form we can better see the similarities and differences in the curves. Two models from one modeling group really stand out…they’re the models that started with the lowest absolute incident shortwave radiation. Those models show a much stronger increase in solar forcing during the hindcast and they show a curious decrease in incoming sunlight from the early 2000s to 2100. The other models tend to agree with one another during the hindcast (1861-2005), but then run out of synch during the projections. Not illustrated: At least one of the modeling groups appears to include a Solar Cycle 24 of lower amplitude, and then repeat Solar Cycles 22, 23 and 24 into the future. As a reminder, the outgoing shortwave radiation represents a portion of the incoming sunlight that’s reflected back to space, primarily by clouds and volcanic aerosols. Where incident shortwave radiation is basically an input, outgoing shortwave radiation is a model-calculated value. Figure 5 presents in absolute terms the TOA outgoing shortwave radiation of the 21 individual CMIP5-archived models with historic and RCP6.0 forcings. The thing that stands out most is the wide range of model-manufactured values. Based on the 1996-2015 averages, there’s about a 10 watts/m^2 span from the model with the minimum average to the model with the maximum, while there was only a 3 watts/m^2 span in the amount of incoming sunlight (Figure 3). The upward spikes show the impacts of volcanic aerosols on the outgoing shortwave radiation. Figure 6 presents the long-term hindcasts and projections of outgoing shortwave radiation, but this time in anomaly form, referenced to the 1996-2015 base years. The use of anomalies allows a better visual comparison of the modeled changes before and after the transition from hindcast to forecast. Obviously, there are very wide ranges in the hindcasted and forecasted trends in model-simulated outgoing shortwave radiation. 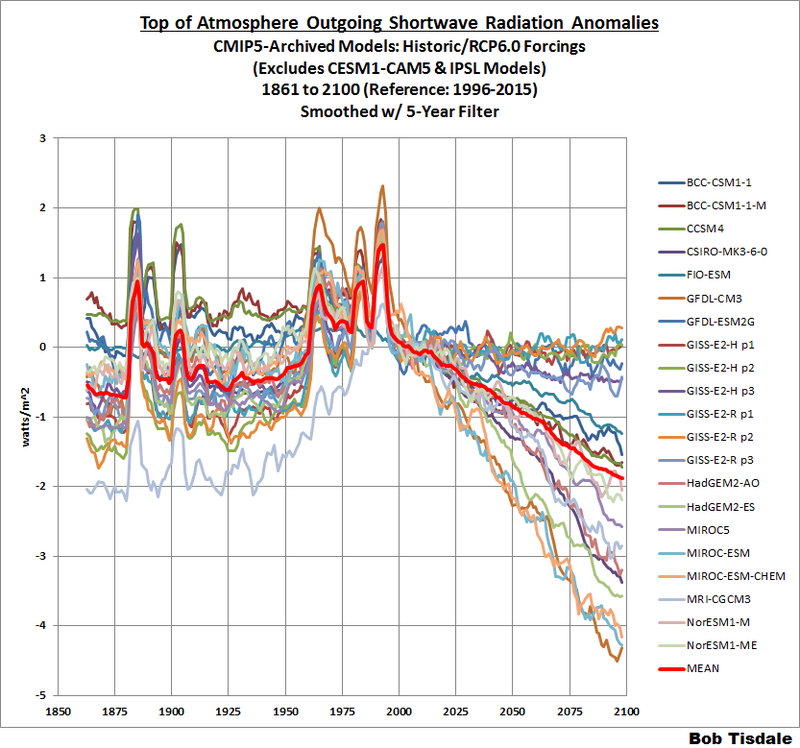 Again, note how the model mean shows increasing outgoing shortwave radiation in the past and a decrease in the future. 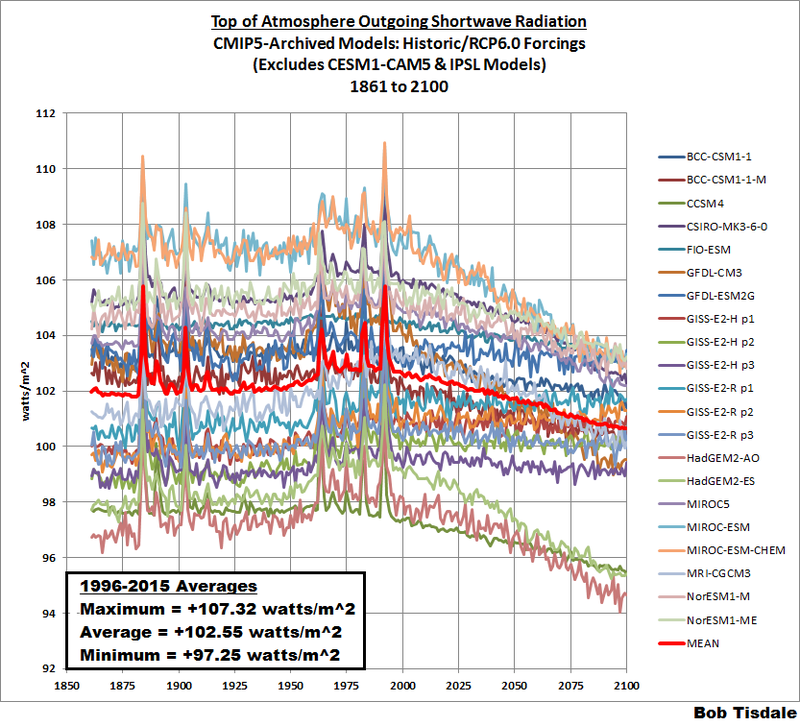 While the model mean of the outgoing shortwave radiation increases at a rate of about +0.08 watts/m^2/decade from 1861 to 2005, some models show a sizeable increase and others show little to no trend. Only one model shows a decline during the hindcast, and its trend is relatively flat at about -0.01 watts/m^2/decade. The model with the fastest increase from 1861-2005 has a trend of about +0.16 watts/m^2/decade. In other words, there’s about a 0.17 watts/m^2/decade spread in the trends of hindcast outgoing shortwave radiation. 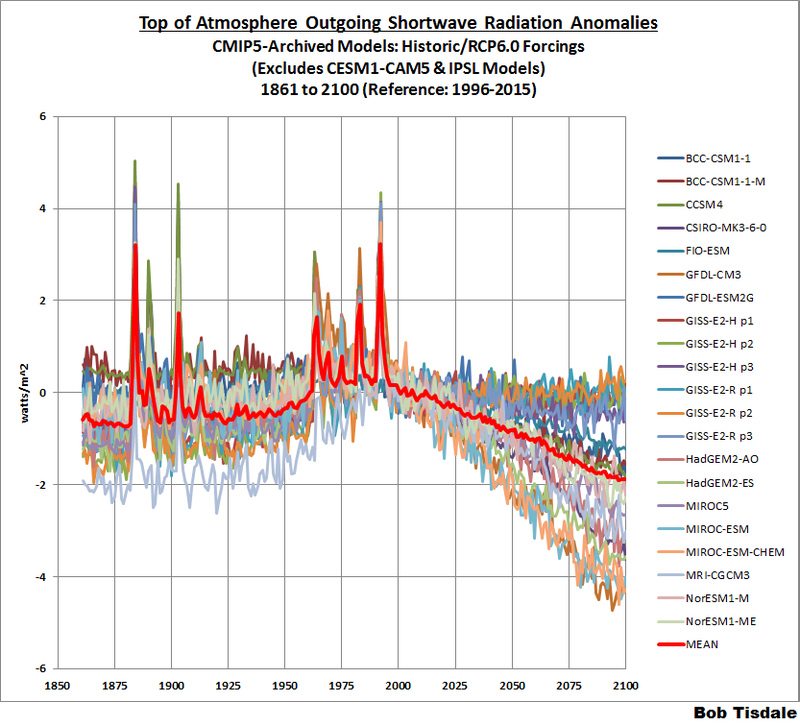 Looking at the projections for 2006 to 2100, the model mean of outgoing shortwave radiation has a negative trend of about -0.21 watts/m^2/decade. But some models show outgoing shortwave radiation increasing slightly in the future, while others show it decreasing at a much greater rate. The greatest negative trend is about -0.48 watts/m^2/decade. At the other end of the wide spectrum is a model with a relatively slight positive trend of +0.02 watts/m^2/decade. Bottom line: there’s about a 0.5 watts/m^2/decade spread in the projected future outgoing shortwave radiation, with some models showing little change and others a sizeable decrease. In Figure 7, I’ve smoothed the model outputs of outgoing shortwave radiation with 5-year running-mean filters to help show the differences in the shapes of the individual model curves. One might conclude that a lot of different and contradicting assumptions go into the simulations of Earth’s climate. There certainly is little agreement among modeling groups about how sunlight impacted the energy imbalance in the past or might impact it in the future. Reminder: the TOA outgoing longwave radiation component of the Earth’s budget represents the infrared radiation emitted to space. Like outgoing shortwave radiation, outgoing longwave radiation is a model-calculated value, not an input like incident shortwave radiation. The model simulations of outgoing longwave radiation in absolute form are shown in Figure 8. They too show a massive spread in simulated values. The 10 watts/m^2 difference during our base period indicates there is little agreement among the models on how much infrared radiation is presently being emitted by Earth to space. 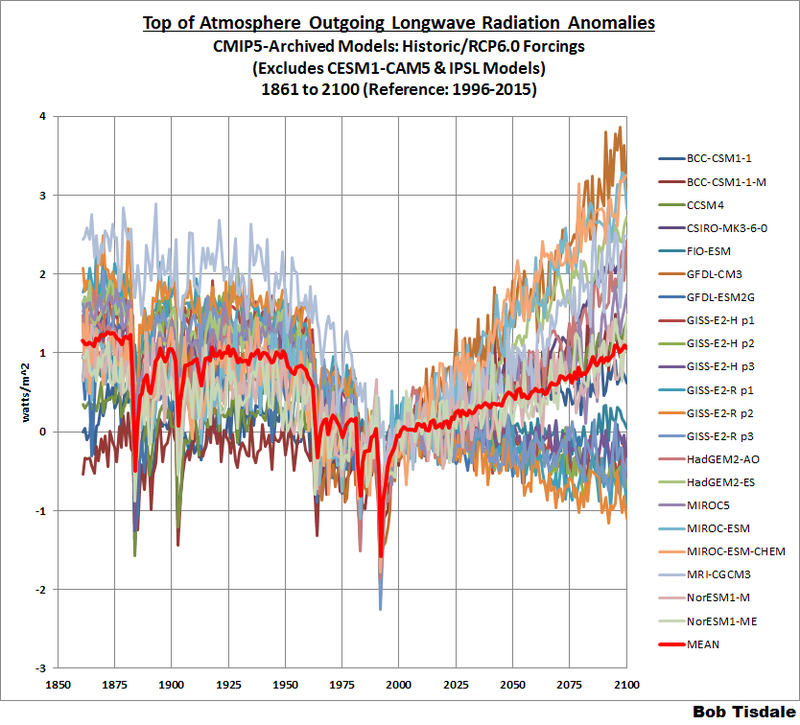 The model simulations of outgoing longwave radiation are presented as anomalies (referenced to the base years of 1996 to 2015) in Figure 9. As noted earlier, the model mean shows outgoing longwave radiation decreasing during the hindcast but increasing during the forecast. For the hindcast period of 1861 to 2005, the model mean of the outgoing longwave radiation declines at a rate of about -0.1 watts/m^2/decade. The model with the slowest decline during the hindcast has a trend of about -0.02 watts/m^2/decade, while the model with the fastest decline from 1861-2005 has a trend of about -0.17 watts/m^2/decade. That is, there’s a spread of about 0.15 watts/m^2/decade during the hindcast. 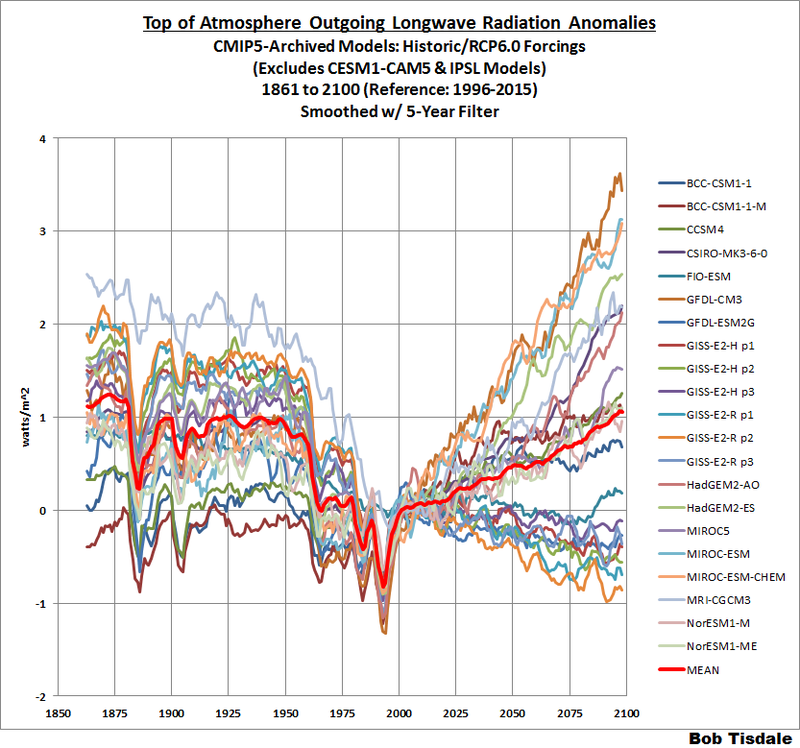 Looking at the projections for 2006 to 2100, the model mean of outgoing longwave radiation has a positive trend of about 0.1 watts/m^2/decade. But some models show outgoing longwave radiation decreasing slightly in the future, while others show it increasing. The greatest negative trend is about -0.1 watts/m^2/decade. At the other end of the wide spectrum is a model with a positive trend of 0.35 watts/m^2/decade. Bottom line: there’s an approximate 0.45 watts/m^2/decade spread in the trends of projected future outgoing longwave radiation, with some models showing an increase and others a decrease. Figure 10 presents the modeled outgoing longwave radiation anomalies smoothed with 5-year filters, to provide a clearer view of the differences in the model simulations. 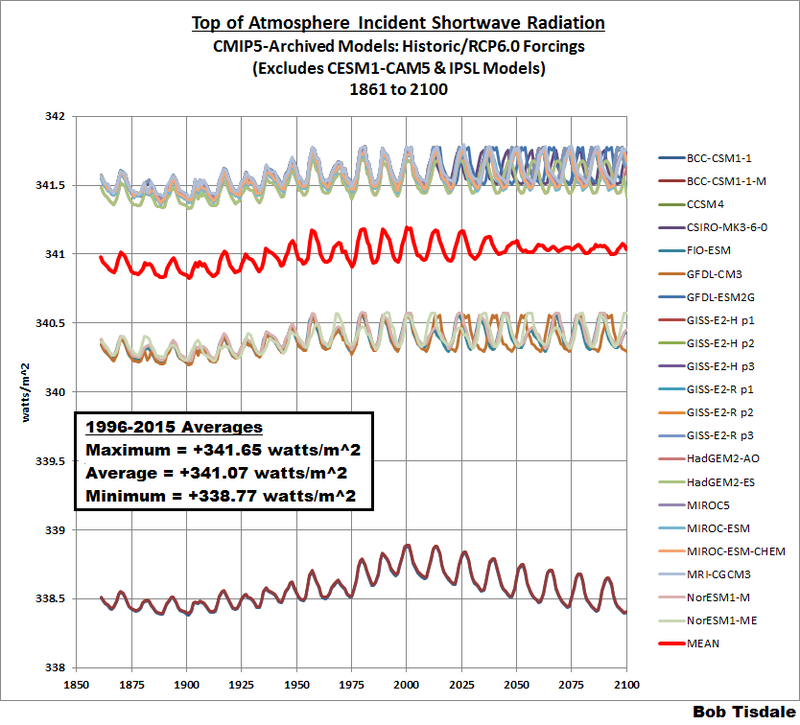 WHY ARE THE DIFFERENCES IN THE TRENDS OF OUTGOING LONGWAVE AND SHORTWAVE RADIATION SO LARGE? If you’re thinking the reasons for the wide ranges in hindcast trends and, similarly, the wide ranges in the forecast trends of outgoing longwave and shortwave radiation have to do with modeled representations in clouds, you’re likely correct. A large degree of uncertainty in global climate models (GCMs) can be attributed to the representation of clouds and how they interact with incoming solar and outgoing longwave radiation. In this study, the simulated total cloud fraction (CF), cloud water path (CWP), top of the atmosphere (TOA) radiation budgets and cloud radiative forcings (CRFs) from 28 CMIP5 AMIP models are evaluated and compared with multiple satellite observations from CERES, MODIS, ISCCP, CloudSat, and CALIPSO. Through a comprehensive error analysis, we found that CF [total cloud fraction] is a primary modulator of warming (or cooling) in the atmosphere. The comparisons and statistical results from this study may provide helpful insight for improving GCM simulations of clouds and TOA radiation budgets in future versions of CMIP. Basically, Dolinar et al. acknowledge that a large source of the uncertainties in outgoing longwave and shortwave radiation in GCMs is clouds. 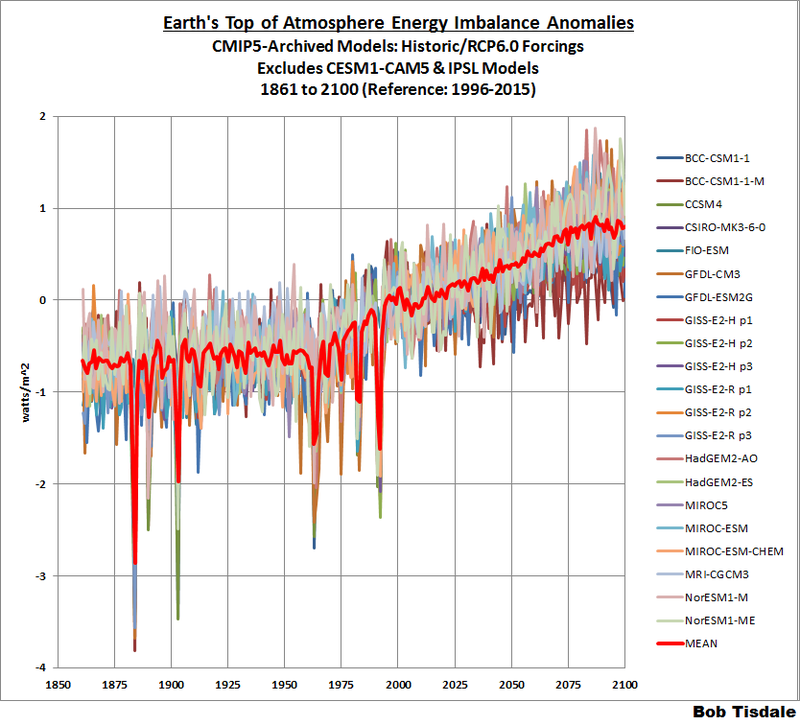 If you were to scroll up to Figures 9, 6 and 4, you’d note that the scales of the anomaly graphs are very different for the three components of the top-of-the-atmosphere energy imbalance. That is, the differences in the simulated TOA outgoing shortwave radiation are so great that the y-axis on Figure 6 spans 12 watts/m^2, while the y-axis for TOA incident shortwave radiation anomalies in Figure 4 only spans 0.7 watts/m^2. To put those metrics into perspective, for Animation 1, I’ve used a common scale for the spaghetti graphs of the model outputs. And to help minimize the model noise and show the differences between the models, I’ve smoothed them all with 5-year running-average filters. As you’ll recall, Earth’s energy imbalance is determined by subtracting the outgoing shortwave radiation (reflected sunlight) and the outgoing longwave radiation (emitted infrared radiation) from the incident shortwave radiation (incoming sunlight). In other words, for the climate models, we’re basically subtracting two computer-calculated values from a computer input. We’ll start with the energy imbalance in anomaly form. We presented the outgoing shortwave radiation (Figure 6) and outgoing longwave radiation (Figure 9) as anomalies to show the differences between the individual models. But for the energy imbalance, Figure 11, they’re presented as anomalies to show how similar the curves are. That is, there were amazing differences in the basic curve shapes and trends of the individual model simulations of outgoing longwave and shortwave radiation, but remarkably, though not unexpectedly, the basic curves of the modeled TOA energy imbalance are much more similar in shape. Figure 12 presents the TOA energy imbalance anomalies smoothed with 5-year filters. Animation 2 is the same as the “perspective animation” (Animation 1) but it also includes the energy imbalance anomalies smoothed with 5-year filters. Again, we presented the modeled energy imbalances to show the similarities in the curves, but our primary focus is the modeled TOA energy imbalances in absolute form. That range in modeled energy imbalances was so great, not only did I double check all of the spreadsheets and downloads, but I cross-checked the extremes. Those extremes in the modeled energy imbalances come from two modeling groups, the two highs from one and the two lows from another. To cross-check the results, I downloaded the outputs for the 4 model runs from those two groups (2 each) but this time using the outputs of the historic/RCP8.5 (worst-case) scenario. See Figure 14. The spread is a tick higher with the RCP8.5 scenario. As one would expect, the RCP8.5 scenario also causes the energy imbalances to rise faster in the future than with RCP6.0. The precision achieved by the most advanced generation of radiation budget satellites is indicated by the planetary energy imbalance measured by the ongoing CERES (Clouds and the Earth’s Radiant Energy System) instrument (Loeb et al., 2009), which finds a measured 5-yr-mean imbalance of 6.5Wm−2 (Loeb et al., 2009). Because this result is implausible, instrumentation calibration factors were introduced to reduce the imbalance to the imbalance suggested by climate models, 0.85Wm−2 (Loeb et al., 2009). Phrased differently, because the satellites were inaccurate, climate scientists had to rely on the outputs of climate models and assume they were correct. If a 6.5 watts/m^2 energy imbalance is considered “implausible”, what about model-simulated energy imbalances of -2.2 watts/m^2 and +2.8 watts/m^2? Are those values implausible as well? If so, why are those models used by the IPCC? Didn’t they bother to check whether the models presented plausible simulations of Earth’s energy imbalance? What about the four models that show a negative imbalance during our base period of 1996-2015? If those models are correct, then the hypothesis of human-induced global warming has a very big problem. A negative imbalance indicates that presently more energy is being reflected and emitted by the planet than is being received from the sun…and that our emissions of greenhouse gases are returning the Earth to a balanced energy budget. On the other hand, recall that Trenberth et al. (2014) gave us an approximate range for the energy imbalance of 0.5 to 1.0 watts/m^2. There are 5 models that produce an energy imbalance greater than 1.2 watts/m^2 for the base period of 1996-2015. If they’re right, then there’s even more heat than is presently unaccounted for. They’ll have to call out more search parties to look for all of that missing heat. The second thing the large range of modeled energy imbalances reminded me of: there is a similar large range in the modeled global surface temperatures in absolute form. 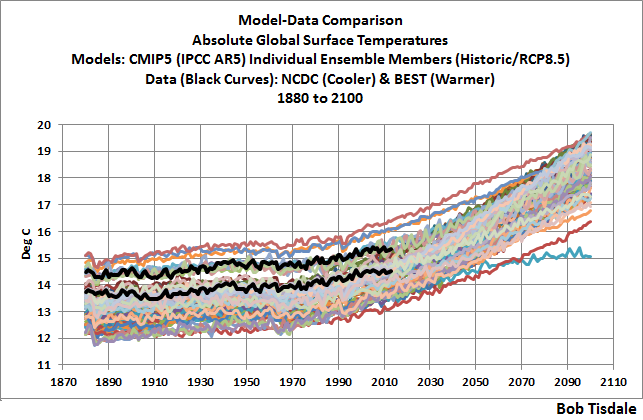 See the graph here from the post On the Elusive Absolute Global Mean Surface Temperature – A Model-Data Comparison. The span of the modeled surface temperatures in 2010 was more than 3 deg C, and that’s about 3 times greater than Earth’s surfaces have warmed since pre-industrial times according to the (much-fiddled-with) observations-based data. Second, the absolute value of the global mean temperature in a free-running coupled climate model is an emergent property of the simulation. It therefore has a spread of values across the multi-model ensemble. Showing the models’ anomalies then makes the coherence of the transient responses clearer. However, the variations in the averages of the model GMT values are quite wide, and indeed, are larger than the changes seen over the last century, and so whether this matters needs to be assessed. “…needs to be assessed” indicates they hadn’t bothered to do it by then…and likely still haven’t. Climate models have been used by the political entity called the IPCC for almost 2 ½ decades to support a political agenda known as the UNFCCC. In those 2 ½ decades, apparently the climate science community hasn’t bothered to check to see whether it matters that the spread in absolute modeled global mean temperature is three times greater than the warming that’s taken place since pre-industrial times. Now, let’s consider the absolute values of the radiative imbalance shown in Figure 13. The model mean shows an average energy imbalance of 0.79 watts/m^2 for the base period of 1996-2015, and Earth’s energy imbalance (based on the model mean) was about 0.10 for the first 20 years of 1861-1880 (the pre-industrial values). So, based in the model mean, Earth’s energy imbalance has increased roughly 0.69 watts/m^2 since pre-industrial times. But the range of the modeled energy imbalance (based on the CMIP5-archived models with historic and RCP6.0 forcings) during the base period spans about 5 watts/m^2. That’s more than 7 times greater than the 0.69 watts/m^2 modeled increase. Can we presume that the climate science community has not bothered itself to assess whether that matters, too? Maybe they’ve been avoiding it. Much of this post discussed and illustrated that there was no agreement among climate models about what caused the Earth’s assumed energy imbalance and how those factors might change in the future. To help drive that point home, I’ve prepared Animation 3. It includes the energy balance and its three components in anomaly form for each of the models included in this post. All outputs have been smoothed with 5-year filters to minimize the noise inherent in the models. With increasing greenhouse gases in the atmosphere, there is an imbalance in energy flows in and out of the earth system at the top of the atmosphere (TOA): the greenhouse gases increasingly trap more radiation and hence create warming (Solomon et al. 2007; Trenberth et al. 2009). ‘‘Warming’’ really means heating and extra energy, and hence it can be manifested in many ways. Rising surface temperatures are just one manifestation. Climate models have been programmed to raise modeled surface temperatures and subsurface ocean temperatures as the simulated energy imbalance increases in response to the numerical representations of manmade greenhouse gases and other climate forcings. Climate models have also been programmed to create number-crunched changes in numerous other metrics so that they show rising sea levels, decreasing sea ice, ice sheet and glacier mass, increasing precipitation, and so on as the energy imbalance increases. As a result, there is a general agreement among the models that, as the energy imbalance increases in value, the Earth will gain heat and extra energy…and that the heat and extra energy will be “manifested in many ways”. what the absolute values of the energy imbalance were in the past, are presently and will be in the future. Climate models have been programmed to show global warming and all of its manifestations in response to rising energy imbalance values. But modeling groups go through very different gyrations (by manipulating clouds?) with the two computer-calculated components of the Earth’s energy budget at the top of the atmosphere in order to achieve that warming…which indicates there is no consensus on how Earth’s atmosphere and oceans have responded in the past, are responding now, and will respond in the future to manmade greenhouse gases. No consensus whatsoever. My thanks to Judith Curry for suggesting papers that helped me better understand this topic and to Willis Eschenbach for taking a look at a draft of this post. This entry was posted in Climate Model Failings, Climate Model Problems. Bookmark the permalink. Thanks Bob, well written and comprehensive. “It all looks straightforward enough, but then when you look closely you see something strange, off on the right side: The radiation coming off the surface is huge, and there is an almost equally huge ‘back radiation’ from the atmosphere to the surface. To a physicist–or at least to this physicist–that strange, gigantic loop of energy between the atmosphere and the surface appears unphysical, out of all proportion to the rest of the diagram. “Just that one fact is enough for me to see that the ‘climate science’ of the U.N. and the consensus of (so we are told) 97% of all climate scientists–is absurd. No part of the ‘global energy budget’ can be greater than the incident energy. Either their numbers are wrong, or the model being illustrated is wrong. Period, full stop. You don’t have to know, or explain to the world, what is really going on, or why there has been recent ‘global warming’. Just know their explanation is nonsense, basic physics absolutely and undeniably forbids it. Everything else you read is either other scientists trying to show they know what is really going on (which obviously no one does at this point, entirely), or scientists or their followers trying to defend the indefensible, with complex, technical and always wrong-headed arguments. A little later, I realized the 390 W/m^2 supposed to be coming off the Earth’s surface was just that expected from a blackbody at the same temperature (288K), and then learned that the proponents of the radiation transfer theory (behind all those numbers in the “energy budget” diagrams and in discussions of “TOA radiation imbalance”) actually believe and teach, in their theory, that the Earth’s surface radiates like a blackbody poised in a vacuum. At this point, an honest and competent physicist can only recoil in horror, as if at a monstrous snake on one’s doorstep, and demand it be killed forthwith. And that’s where I stand, ever since. Trenberth is a miseducated idiot. All climate scientists are miseducated idiots, for not seeing that lie, of a huge loop of energy between atmosphere and ground, greater than that coming from the Sun, and expecting to get away with presenting it seriously to the world. …and then I found the “skeptics” didn’t see it either, or pretended not to, because they never speak of it, that obviously ridiculous incompetence at the very heart of the consensus case. I suggest that OLR at TOA is a function of the average rate of change of dew point (from surface to TOA) of what space sees, not atmospheric temperature. However, right at the surface of water or ice, the atmosphere will be saturated and the temperature will be the dew point. Think about radiation from cold cloud tops. which function description is more correct? 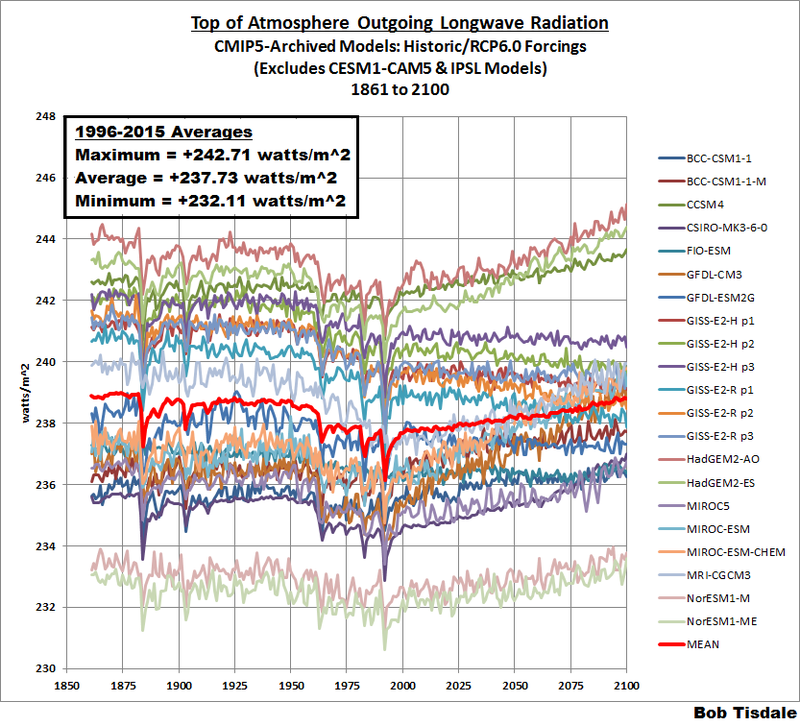 Bob, I found this post particularly interesting; not because of the wide divergence among models (we knew a bit about that), but because almost all models appear to agree that the present is a very special moment in the history of the planet, when the trends in outgoing longwave and outgoing shortwave radiation suddenly reverse. This is the most remarkable thing I have seen about climate simulations until now and it begs for an explanation. If you have not made a mistake, I think that you have come across something important which is worth exploring further. What has happened in the modelling process to produce something like this? Why has it not been reported before (or has it)? What are the consequences for the fitness for use of these climate models? Among the CMIP5 models, are there any models which do not suffer from this, and how do they differ from the others? I would dig deeper into this if I were you, and get modellers involved, if you can. It will be worthwhile. Pingback: Climate Models Fail: Global Ocean Heat Content (Based on TOA Energy Imbalance) | Watts Up With That? 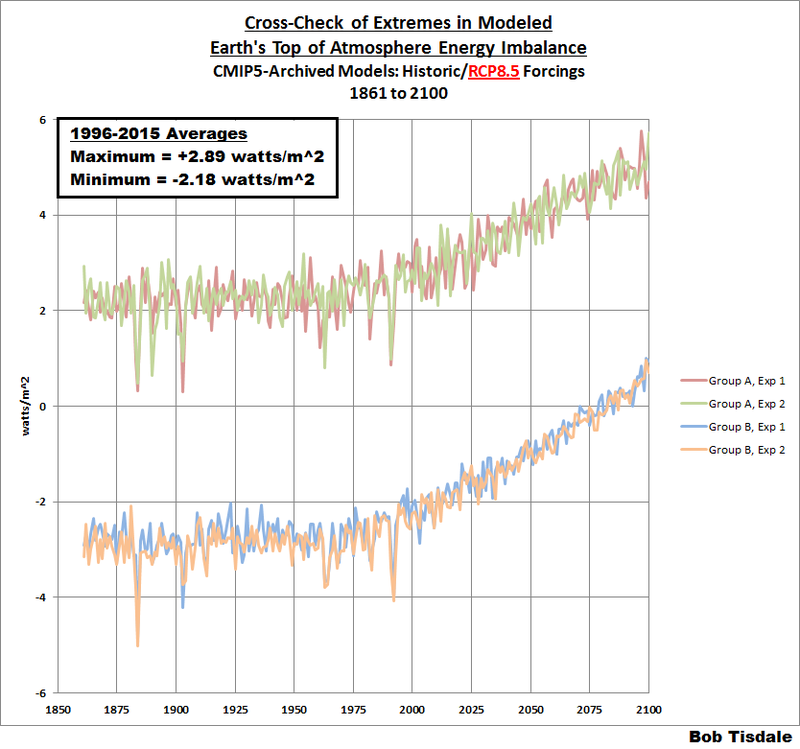 Pingback: Climate Models are NOT Simulating Earth’s Climate – Part 3 | Watts Up With That? Thanks,It is a very interesting work.And I want to know why not TOM(top-of-model) but TOA(top-of-atmosphere) to measure for the energy balance of the climate model?